The No. 2 Bulls-Eye was introduced in 1892 by the Boston Camera Manufacturing Company. It was the first rollfilm camera with a red window as the exposure number indicator. That was possible since rollfilm was paper-backed. Maybe the red-blindness of early film material was the reason to choose red as the color of that window. Kodak copied the camera as No. 2 Bullet camera in 1895, and paid a patent license fee to the original manufacturer for the red window patent. Later Kodak took over the other camera maker. 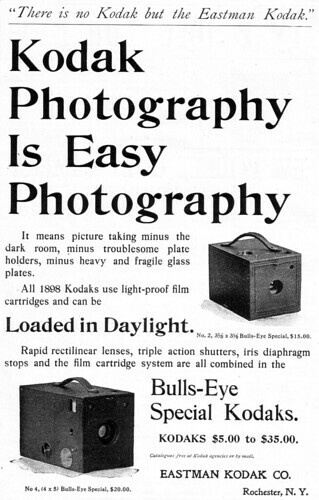 "Bulls-Eye" became a camera brand of Eastman Kodak. The No. 2 Bulls-Eye Special was a higher-quality variant of the No. 2. It had a Rapid Rectilinear lens of Bausch & Lomb, an iris diaphragm and a Kodak "Triple action" shutter.